My biography, Lin-Manuel Miranda Award-Winning Musical Writer, was released this month. My initial interest in Miranda was because of his great success with the Broadway musical Hamilton. I was curious about Miranda and his writing. I wondered why he wrote a musical about our Founding Fathers and cast African American actors in the roles of George Washington and Thomas Jefferson. 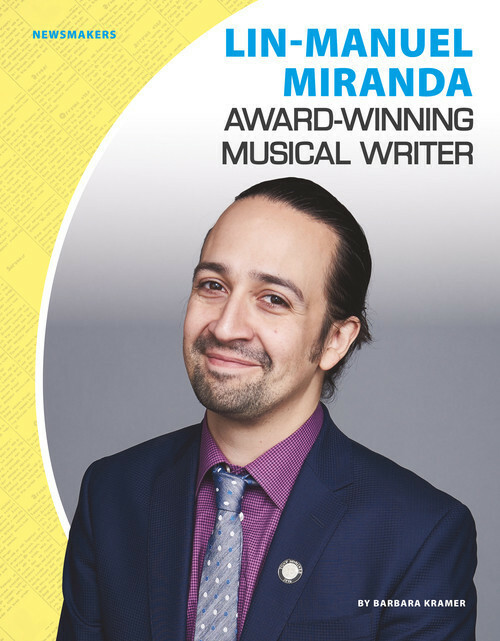 Miranda, who is of Puerto Rican descent, played the role of Alexander Hamilton. As I began my research, I quickly discovered that getting to know more about Miranda was a lot of fun. Here are five of my favorite tidbits from my research. Miranda didn’t like piano lessons. He began taking lessons when he was six, but he did not stick with it. He didn’t like to practice. Turns out, piano lessons were not necessary because Miranda can play by ear. He can hear a song and then sit down and play it without seeing the music. But he did like applause. Miranda performed in a piano recital when he was about seven. When he finished his song, the audience applauded. Miranda like that attention so much, that he played another song and then another. After his fourth song, the teacher nudged Miranda off the bench to give the other students a chance. Miranda got his first acting role in sixth grade. He played rock star Conrad Birdie in the musical Bye Bye Birdie. All the girls had to pretend to faint when he walked on stage in his shiny gold jacket. That was heady stuff for a 12-year-old who was shorter than most of the girls he knew and pretty much off their radar. Miranda writes and then rewrites, rewrites, and rewrites. He wrote his first play, In the Heights, when he was in college. Eight years later, it opened at 37 Arts Theatre in New York, and a little over a year later, it opened on Broadway. Getting a play he wrote in college ready for a New York stage took a lot of rewriting. By the time Miranda was finished, all that was left of the original musical was a few notes from the first song. He wrote several songs for The Electric Company, a children’s show on PBS. One song featured a rap battle between a very negative apple and an optimist hot dog. Miranda appeared on the show as the hot dog, who countered the negative words spewed out by the apple with positive words. You can watch that video here. As for Miranda’s casting decisions for Hamilton, he said he wanted people to feel that everyone is part of the United States even if they do not look like the Founding Fathers. Miranda has a lot to say about immigration, and that was another reason I wanted to write about him. I’m hoping my biography about Miranda plays at least a small part in getting kids to talk about immigration. They are important conversations to have, now more than ever. He is a very talented man. Enjoyed the tidbits.